Last week I took a genealogy “vacation”. I didn’t go far in miles but I did in years. As I live where the majority of my ancestors did going back to (at least) the 1800s, my trips were local. I love the convenience of internet research. But I also LOVE on-site research. I love walking into a library, archive or society and getting that first whiff of old books, flipping through big, bound volumes of records and chatting with other researchers. So, I decided to take a few days and do some on-site searching. The main focus of my research was to explore the Whitaker line on my mother’s side. Most of the information I had to date came from census information, I had done no in-depth research. Some searching on ancestry.com revealed that this line had a long history in the county that I live in. So I made some preparations for a couple weeks beforehand. I normally wouldn’t spend quite this amount of time but this line has gone largely unresearched, so I was essentially starting with nothing but some names and estimated dates. First, I spent some time with my database file, getting familiar with the names, dates and locations for the family I wanted to research. One thing I realized is that this family has been in Harford County longer than the county existed. So, I may also need to search Baltimore County for records before 1774. Then I spent an evening in my local public library. They have a “Maryland Room” with extensive local history resources. I found some additional information in books and compiled data. I hopped on ancestry.com to look at some other trees for “clues” I was missing and made notes. One of my favorite types of records are land records, so I spent some time with mdlandrec.net plowing through land records. Based on the sources listed in the books from the library and others’ information on ancestry.com I knew I should visit the Historical Society of Harford County, the Maryland State Archives and the Maryland Historical Society to start. So I double-checked their websites to check the days and hours they were open so I could plan my research week. I had never been to the Historical Society Harford County before so I wanted to spend more time there to get the lay of the land. I decided I would go there Tuesday and Wednesday, the Maryland State Archives on Thursday and the Maryland Historical Society on Friday. There would be no cemetery visits during my week because we have gotten so much rain recently that I was afraid it would either be too soggy, plus there was more rain in the forecast. I will save that for another time…and advantage of being local. Monday – None of my repositories were open so it was back to the library for more searching there. I found some more references to church records and tax lists. Tuesday/Wednesday – Off to the Historical Society Harford County across town. They charge $5 for non-members to do research but I went ahead and joined for $30. I am certain I will get my money’s worth. I got a tour and an overview of the collections. I decided I would start my searching with the vertical file. I pulled the Whitaker family file and the first thing in the folder was a 1973 article from the local paper (complete with a picture) about how, when demolishing a house, the workers discovered a burial plot marker being used as a back step. The over 500 pound marker had the names of my 5th great-grandparents and several of their children. Second, an article written by a Whitaker descendent in 1984 about the Whitaker family that was published in the Maryland Historical Magazine outlining the family. This article had lots of references to wills, other land records and sources for dates and marriages. Awesome information! Including the time it took to signup and get a tour I have been here 25 minutes and already found 2 great pieces of information I never knew existed! By the end of my second day there I had lots of new information as well as sources for names and dates that I had “collected” in the years previous. But I think the coolest thing I had and was able to hold in my own hands was a letter, written by my 4th great-grandfather Dorsey H. Whitaker. Dorsey was born, married and raised a family in Harford County but later moved to Baltimore County and then Baltimore City, where he died of throat cancer in 1876. 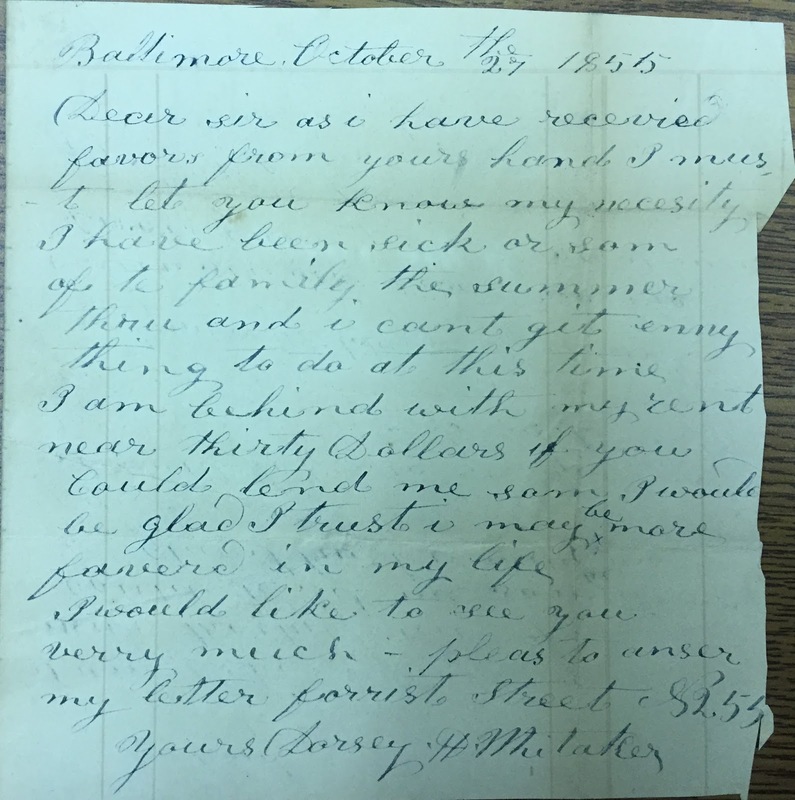 It seems that as he got older he had money problems (based on land records and legal records I found) and this was confirmed when I found a letter written in 1855 from Dorsey to Otho Scott, a Harford County lawyer (and I think a cousin to Dorsey as well). Maybe at some point in the future I could have found this on the internet, but there is something special about holding the same piece of paper that your ancestor held almost 160 years ago. Thursday – My longest trip of the week, a 45 minute drive to the Maryland State Archives. I have been to the Archives many times and always have a hard time staying on task because there are so many records. This time was no exception! I only found a few Whitaker records before the “BSOs” (bright shiny objects) got to me. But I crossed several records from my wish list so the trip was successful. Friday – Unfortunately my Friday trip to the Maryland Historical Society did not happen as I had to take one of my dogs to the vet. However, I do visit there often so I wasn’t too upset. I will get there again very soon and hopefully cross a few more items off my list. I am so glad that I took that time to do on-site research and I kick myself that I don’t do it more often, especially since I have such great facilities so close to where I live. Last week I took a field to the Maryland Historical Society, specifically to the library for a research session. My mom tagged along. She is retired and has expressed a lot of interest in the family research. So I asked her if she would like to join me, and she did. I also thought maybe she would like to cruise through the museum. So, after signing in we headed to the library. We walked in, I showed Mom where things were and she was content to browse some family history books. Meanwhile, I have had one specific focus, finding more information on my 4th great grandfather Charles Henry (see my previous post: Come Out, Come Out Wherever You Are). Since the discovery of his death notice I have come no closer to finding him. Among the library’s resources, the Historical Society has funeral home records for mainly one funeral home. By no means does this guarantee a find, but it was worth a shot. Unfortunately, I did not correctly read the finding aid on-line and failed to notice that Charles Henry’s year of death (1883) was not included in the collection. Not at all a surprise considering my problems finding any information about Charles. AHHHHH! OK, well, while I am here, let’s see if I can find anyone I “know” in the index. I searched all my normal surnames; Henry, Bull, Carman, Bensel, Blatchley, Burk and Pisani. Name after name I came up with nothing…until Pisani. Several family member of Egisto Pisani, including Egisto himself, were listed. As I talked about briefly in my post Who was Massimo?, I believed that Egisto was my 2nd great grandfather’s brother. Egisto, Massimo (and Antonio) were all fruit dealers in Baltimore City in the mid-late 1800s. Early city directory listings had them living near each other and sharing or having very close business addresses. Also, Massimo’s death certificate listed his father’s name as Egisto Pisani. Therefore, I don’t think it is a stretch to think that at least Massimo and Egisto could be brothers. I had found Egisto’s obituary (no mention of parents or siblings) and found him in the Baltimore County, Maryland death index (have not been to the Archives to pull the certificate). I requested the volume that contained Egisto’s funeral record. Before I opened the book I spent a few minutes talking with mom about what I knew, what I thought and why I was happy to find that Egisto was listed in these records. Both Mom and I were excited as we flipped through to the correct page. We got to the page and I skimmed down the page. All the information was interesting but I was particularly interested in his parents’ info. All excitement was lost when I saw his parents’ names. Not even close to what was listed on Massimo’s death certificate. Under my breath I said, “Damn, they are not brothers”. Now, I know that I can’t take either Massimo’s death certificate or Egisto’s funeral record as the last word. And, there is still no reason to think that they weren’t related at all, I was just hoping for a closer relationship. We made notes, took pictures of the pages and looked at a few more records. Then it was lunchtime. We went and got some lunch and had a nice walk to and from Tio Pepe’s. After we got back we toured the museum, which took up the time we had left in the afternoon. So, I would sum up the day as a great day because I got to spend the day with my mom, sharing an interest. The day could have gone better if we had been able to find some new or confirming information, but I still wouldn’t trade the day I had. This past Saturday I attended a seminar that was jointly hosted by the Maryland Genealogical Society and the Maryland Historical Society called “Finding You War of 1812 Ancestors”. The seminar is just a small part of many events celebrating the anniversary of Maryland’s involvement in the War of 1812. There were several speakers and it was very informative. Although I have yet to identify an ancestor that was involved in the War of 1812 I am so glad I attended. Not only did I learn a lot about specific events of the war and Maryland’s heroes, records and resources available for the participants, but I found both the museum and the library of the Maryland Historical Society FASCINATING!! I am embarrassed to admit that this was my first visit to the Maryland Historical Society. It definitely will not be my last! The museum had some great exhibits. One of the new exhibits is “BEARINGS of Baltimore, Circa 1815“. University of Maryland Baltimore County researchers have created an interactive display of Baltimore in 1815. It does not show everything, but it does include many Baltimore landmarks. You can zoom around and overlay Baltimore in 2014 as well. Again, the 2014 doesn’t show everything but enough to get your bearings (ha ha). Then there is the library. WOW!!! I am definitely taking a couple vacation days to spend time researching there. I was lucky enough to be seated at a table with a nice lady who had visited many times and offered to show me around during the lunch break. I would have investigated anyway, but she gave me some great hints and showed me where specific items were located. I already have identified some things I will be searching for on a trip there soon.